What if your people are the answer to your biggest business challenge? We understand how difficult it is to keep your teams engaged and the pressure is on you to deliver learning experiences that exceed expectations. People deserve the chance to learn and grow together, and with the right training, teambuilding and employee engagement solutions, you can become the learning and development leader that everyone wants to work with. Let us help you create learning journeys and team development solutions, that get you the recognition you deserve. "At Biz Group we believe we can change the way your people think and work every day and we measure ourselves against that daily." 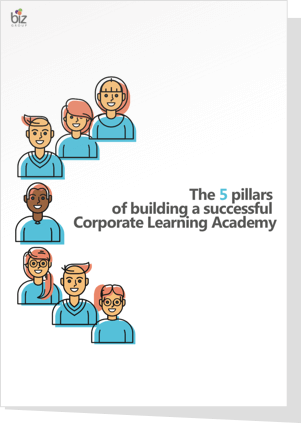 Download our paper about 'The 5 pillars of building a successful corporate learning academy'. This scenario will be familiar to all Learning and Development professionals. You spend hours in planning your training workshops, but you struggle with engaging your learners. Attendance, completion of pre and post-training work and demonstrating a return on your knowledge investment can be challenging. A Training Academy can help you upskill various levels of management in a structured and efficient way. Download this paper to find out more about the 5 pillars of building a successful corporate training academy.